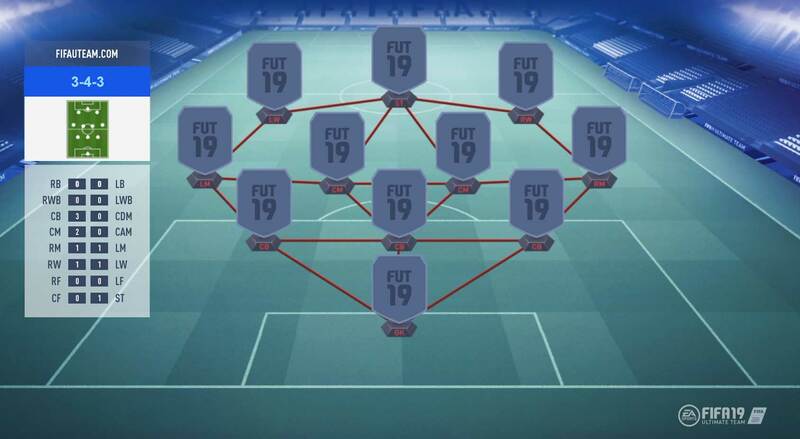 Which one is the best FIFA 19 formation to play? Do you want to know which formation is the best one for your team? 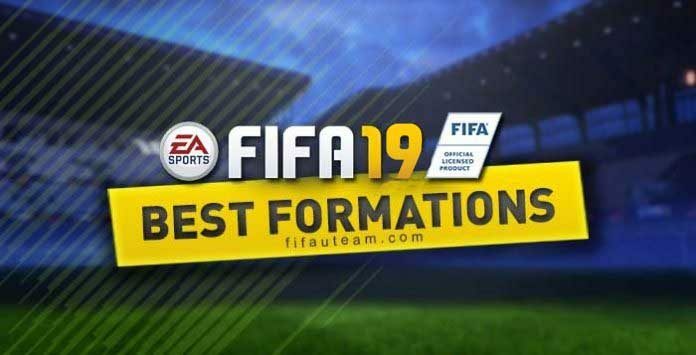 If so, you need to read this guide that shows you how to pick the best FIFA 19 formation to you. Even if you already know which formation to use, be sure to read this article. You will find that there are many options and there is always room for improvement. 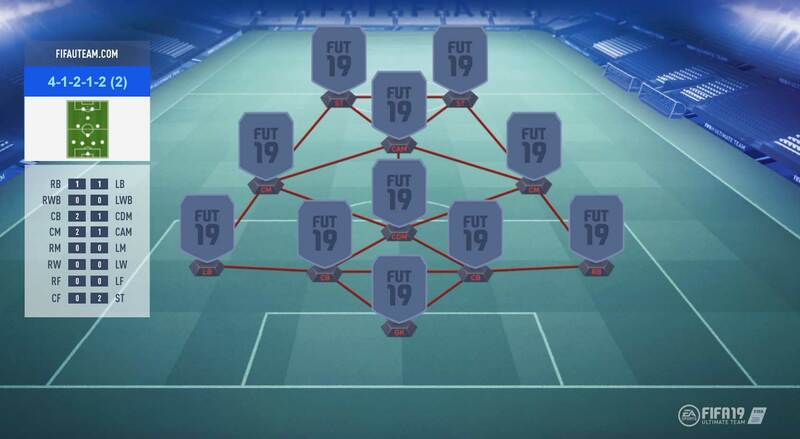 Before you even start to sign players, you should start by setting the best FIFA 19 formation that you will implement in your squad. If you leave the decision for later, you will not equip your squad with players who you really need and you will be penalised in the individual and squad chemistry. You can solve the problem by buying new players and, in certain cases, positioning cards but the investment will be very high. It is also important to notice that there is no better formation than another. All of them have strong and weak points. You should decide which one is better for you. The most common question is: How do I decide the formation that I will use? With which formation do you are most familiar and which ones you like most? There is any formation that let’s you more comfortable? Did you have better results with any formation? Into which formations the players that you think are essential fit? The attributes and skills of your essential players can be better used in some of the formations? 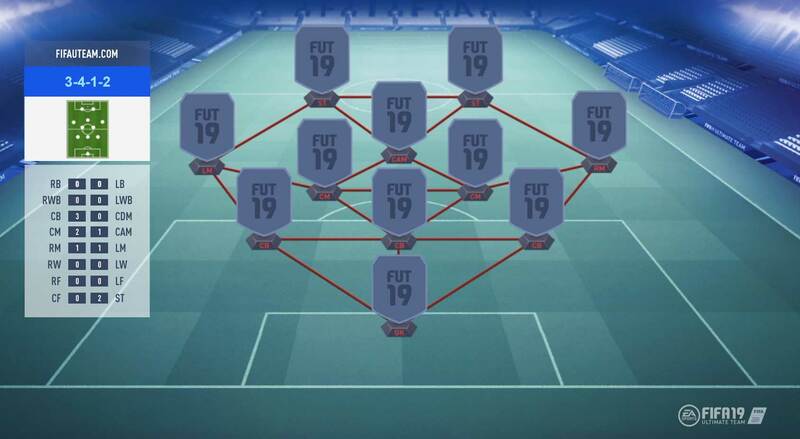 What are the formations best suited to the goals you set for your FUT 19 clubs? Variation of the 4-1-2-1-2 that let players control the midfield. It is even more narrow than the original, giving them a much tighter diamond. Formation much appreciated. Allows multiple offensive options but with the security of two CDM in defence. Similar to 4-3-1-2 but with two CF’s and only one ST or similar to 4-3-3 but the left and right forwards are tucked inside rather than to the wings. One of most famous FIFA 19 formations. Earned greater notoriety for having been adapted by Guardiola. This popular formation in diamond shape has the CAM as key element. One of the less popular FIFA 19 formations. This formation is a variation of 3-5-2 where the wing players are more withdrawn in favour of one of the central midfielders being pushed further upfield into the playmaker position, the “number 10”. Similar to the 3-4-1-2 formation, with a change to the forward players. Even less popular than the previous one. Similar to 3-4-2-1, with the change of forwards to wingers. Similar to 3-5-2, where a defender (preferably a sweeper) helps midfielders on attack and defence. Similar to 4-3-3, that turns one of the midfielders into an attacking midfielder to support the front three. 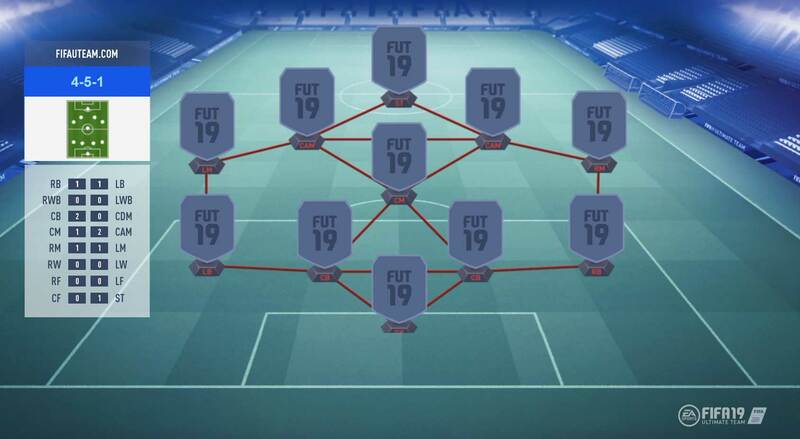 One of less popular FIFA 19 formations for Ultimate Team. Similar to 5-2-1-2 but with 1 up top supported by a left and right forward either side. One of the most solid of the 5 at the back formations in terms of defensive set-up and overall structure. 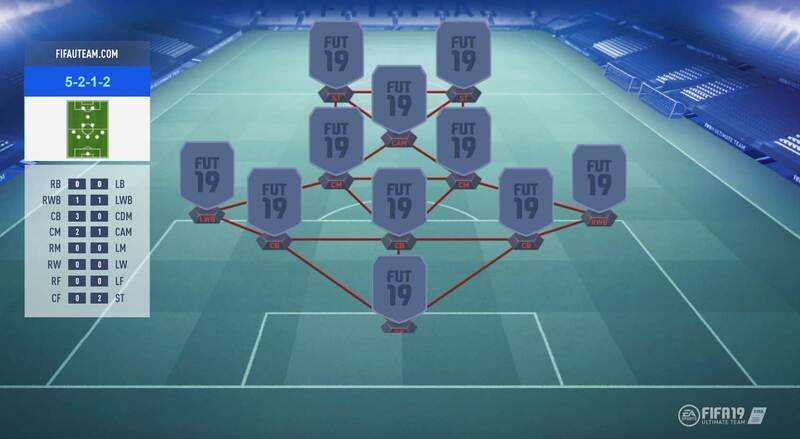 Formation used by fewer FIFA FUT 19 players. Similar to 5-2-2-1 but with two ST with a more creative CAM option. This defensive-minded 4-3-3 variation offers two holding defensive midfielders and one centre midfielder in the midfield. Similar to 5-2-1-2 but with 1 up top supported by a left and right forward either side. It attempts to combine a strong attack with a strong defence. The first of 4-3-3 variations offers a holding defensive midfielder anchor in the midfield. A more defensive variation of the classic 4-4-2 with two defensive midfielders in place of the usual centre midfielders. Formation that puts 5 players in midfield, two of them supporting the striker. For many years, it was the favourite formation of many European teams. The 4-5-1 variation adds more midfield steel. The three center midfielders make it harder to break down on the counter and leaves less gaps for the attack. The 4-1-2-1-2 variation let players control the midfield. It is even more narrow than the original, giving them a much tighter diamond. A variation of 4-4-2 formation with one of the strikers playing in the front line and is supported by an attacking midfielder (CAM) behind him. Widely used in the world of football and in the Premier League in particular. Similar to 4-4-2 but one of ST backs for CF. The classic formation. Widely used in the world of football. Organised structure of defenders and midfielders moving as a lineup and down the pitch. This formation is a variation of 3-5-2 where the wing players are more withdrawn in favour of one of the central midfielders being pushed further upfield into the playmaker position, the “number 10”. Variation of 4-1-2-1-2 that let players control the midfield. It is even more narrow than the original, giving them a much tighter diamond. The classic formation. Widely used in the world of football.Organised structure of defenders and midfielders moving as a lineup and down the pitch. One of the most solid formations. It has 3 central defenders (possibly with one acting as a sweeper). This system is heavily reliant on the wing-backs providing width for the team. We shared with you the required know-how to choose the best formations. Now, it’s up to you. I’m not sure if i should switch back to my 4-3-3 attack or not as statistically my wingers don’t produce alot but i seem to get more out of the team when i play this formation. Just sold keano and van b so 1m burning a hole in my pocket. Any advice? Nice team. You may need more pace in the midfield. Do you have any suggestions on a decent formation which offers both attack and defence, i currently use 4321. Hi Rodrigo, great to follow your advice’s and see people enjoying the game! I enjoy playing with these players but it somehow seems that I’m not able to overcome teams above Legenday mode in single player. Very hard to defend and control the midfield as well as have sufficient attacking speed or space around the flanks and attacking center…should I change formation or mingle around the dynamics/style? Hi. Nice to meet you, José. hi rodrigo and greetings from italy, as you can imagine I’m playing with a serie a formation although I miss some top players (alex sandro, chiellini, dybala and, of course, ronaldo) I think I have an excellent roster, now my doubt is between 433 (handanovic, cancelo, koulibaly, manolas, dalbert, pjanic, nainggolan, hamsik, al three as CM, cuadrado, immobile, douglas costa) or 41212 (2) (handanovic, cancelo, koulibaly, manolas, dalbert, pjanic, nainggolan as CDM, hamsik, milinkovic savic as CAM, immobile, mertens), although as I’m not so excellent in defense I was also thinking about the 532, what could be the best formation, in your opinion, right now? Hi. Nice to meet you. Formations should be chosen according to our playstyle. The best for me may not be for you. If it was to me, I would choose the first one because I like to play with wingers. However, the second team is probably better because Mertens scores much more goals than Immobile. In that case, I would put Matuidi as CDM, Nainggolan and Pjanic as CM and Hamsik as CAM. I don’t really want to replace or lose most of my players, so any advice on how to help me here? Hi, You have an amazing squad! Congratulations. I don’t think they are the problem. You can adjust your tactics and instructions but you can also try to see how 433 att works to you. I’ve been struggling to find a formation that fits my fast counter attacking style for my team! Currently I have in a 451 or 433(4). The issue is, I’m able to score but I get scored ON way more! Pls help! One more time thanks, I have been following your advice for many years now. I know the improvements there require an amount of coins I don’t own (de gea, van dijk, pogba, aguero, aubameyang, kante or de bruyne). Antes de mais, agradecemos a sua preferência. You have a nice team. You should definitely focus on other players beside the top ones. I agree that you need someone to play as CM. In my opinion, you should save for both Eriksen and Fabinho. Thanks Rodrigo. Silva is definetly not a good CM right? it’s CAM or nothing with him? He is better as CAM. You have other better players to play as CM. In FUT, with PL players I use 4222. For chem I ‘m starting with 4321, and after I switch to 4222 . This 4222 is not in your rewiew. I like playing in counter-attacks, but I’m not so good at defending . U think this 4222 need an upgrade , to a new formation or with new players ? Hi. You have an amazing players. You don’t need new ones. You can find more details about that formation clicking here. I love reading the insights you provide. I have a quick question regarding players. Any suggestion to improve on? I am at a lost!! Hi. Your team looks great. Obviously, there is always room for improvements. Have you considered to replace Jesus with a better striker?! Before changing your formation, make the adjustments on your tactics and instructions in order to get the defence as you want. To win against 424 formations you have to place many players in the midfield. Hi Rodrigo, the best guide!!! Could you please tell which clubs can easily use these formations? Like the clubs, not in ultimate team. THANKS. LOVE YOUR GUIDES. HAVE BEEN FOLLOWING YOU SINCE 3+YEARS NOW. GREAT JOB. Do you want to know examples of real world clubs who use each one of these formations. Is this right? To get the chemistry high I’m starting with a formation 4-2-3-1 (Wide), but once the game starts I want to bring the wide mid closer, 4-2-3-1 (Narrow). Do I have to pause the game to change the formation? In that case I need to set up the player instructions and tactics again. (or) I start the game with wide formation as default, then change to other formation using D-Pad? but in that case, I would be losing one of the presets, right? I’m confused about this. Hi. I think you should just use the D-Pad to change to the other formation. You will be losing one of the presets, right, but you still have 3 to use.